Humeral shaft fractures can occur both in the athlete and non-athletic individual, and in both young and elderly patients. These fractures can be managed both operatively and non-operatively with comparable results. Non-operative management typically involves the use of a functional brace, which allows individuals to use the affected limb while it heals. The Sarmiento humeral brace is a commercially available brace used to assist the management of these injuries. We propose a new custom-moulded functional humeral brace which is superior to the Sarmiento /thermoplastic brace in design, construct and patient comfort, whilst providing the stability required for fracture healing. This study investigates the radiological and clinical outcomes of this new brace. Historically, early treatment of humeral shaft fractures involved immobilisation, which often extended from beyond the shoulder past the elbow. This typically resulted in stiffness at both the shoulder and elbow joints, an outcome which was not beneficial. In 1977, Sarmiento et al. first described functional bracing, a form of immobilisation which promoted fracture healing and encouraged motion at the elbow and shoulder joint . Thus, non-operative management through the use of a functional brace is the predominant treatment choice for these injuries, with acceptable healing and functional outcomes in the majority of patients. Consequently, functional humeral bracing has become the frontline clinical choice for definitive management of the humeral shaft fractures. Fig. (1). Our Custom Moulded Brace. 17 patients, aged between 11 and 91 years, were identified from medical records as having treatment with the brace, March 2011 to July 2013. Patients were initially evaluated and managed in the emergency department, and placed in a Plaster of Paris U slab, before being referred to the outpatient fracture clinic for further review and assessment. When swelling was deemed acceptable, the functional brace was applied by qualified experienced senior physiotherapists (Fig. 2). Active movement of the elbow was encouraged, with pendular exercises at the shoulder commenced at 3 weeks post application of brace. The functional brace was removed upon confirmation of clinical OR radiographic union of the fracture. Radiographic union was defined as being present when osseous bridging between the main fragments was observed on at least one radiograph, and clinical union was defined as there is no pain/tenderness at the fracture site. Administration of the SPADI/DASH/CONSTANT questionnaires, and measurements of the elbow and shoulder range of motion was performed by one senior physiotherapist. Range of motion was measured using a goniometer, and for the strength assessment component of the CONSTANT score, a hand-held force dynamometer was used. Fig. (2). Application of our custom brace. Ethics approval from local health district was obtained. 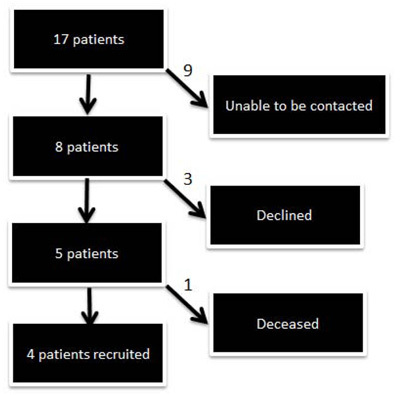 Of the 17 patients identified as meeting inclusion criteria, 9 patients were unable to be contacted, 3 patients did not wish to participate in the prospective component of the study, and 1 patient died during treatment (due to lung co-morbidities) (Fig. 3). Consequently, a total of 16 patients were evaluated for the retrospective component of the study and 4 patients for the prospective component of the study. Fig. (3). Recruitment of Patients for Prospective Component. Demographic information for the 16 patients in the study is detailed in Table 1. All patients were initially managed in a U-Slab for which they were in for an average of 26 days before the functional brace was applied. 5 patients were lost to follow up, and it is unclear when these patients had their brace removed. The functional brace was in place for an average of 73 days or 10.5 weeks before being removed (n = 11). There were no complications (e.g. pressure areas, wounds) of the bracing treatment. All patients had their brace removed once evidence of union was present on x-ray, or when no pain or tenderness was elicited at fracture site. At their final visit, all but two patients, who were lost to follow up, proceeded to either radiographic or clinical union or both (Table 2). At last follow up, 15 patients had acceptable anterior/posterior angulation of less than 200 (1 patient - 220), varus/valgus angulation less than 200, and less than 3cm of shortening. 12 patients had radiological evidence of union, with the other 4 demonstrating significant callus. Fig. (4) shows some examples of some of the study patient’s radiographs. Prospectively, patients (n = 4) were assessed at an average of 510 days (18 months) post brace removal. The average SPADI score at the time of assessment was 3.3, and the average DASH score was 32.1. The analysis of the pain component of the SPADI questionnaire revealed that three patients were pain-free at the time of assessment, with one patient having some residual pain, specifically when lying on the affected limb, and reaching for an object on a high shelf. Similarly, more detailed analysis of the DASH scores revealed that after brace treatment, three patients (the same three without residual pain above), showed no or mild difficulty in performing all questioned tasks. The fourth patient had only mild or moderate difficulty in overhead activities, such as changing a lightbulb or placing objects on high shelves. All patients had less than 11 points difference in Constant Scores between the affected and unaffected limbs, indicating an ‘Excellent’ score. Elbow range of motion in the affected limb in all patients was comparable to the unaffected limb, with no limitations or residual stiffness. Overall these scores indicate a positive functional and pain related outcome for these patients, with three patients having had an almost complete return to previous function. Our practice identified several issues with the commercially available functional Sarmiento brace, prompting the development of a custom moulded synthetic cast brace used in this study. Questionnaires being utilised at a single point in time, thus preventing any comparative analysis over time. However, despite these inherent limitations, most fractures went onto bony union, and most patients were pain-free, and has reasonable clinical function (as demonstrated by DASH, SPADI and CONSTANT scores). Fractures of the humeral shaft can occur from high energy injuries, such as car or cycling accidents, or from low energy events such as falls from standing height. Injuries in the young population are typically of higher energy, whilst elderly patients sustain fractures from low energy accidents such as falls. Humeral shaft fractures can be managed either non-operatively, with use of a brace, or surgically, with intramedullary nails or plate fixation. Functional bracing works by providing a hydraulic compressive centripetal force applied more or less uniformly throughout the diaphyseal segment of the limb . The cylindrical brace effectively compresses the biceps and triceps muscles, with an anterior and posterior shell that is contoured to accommodate the arm musculature, whilst allowing early shoulder and elbow motion [2, 3]. As described by Sarmiento et al., the fracture callus created through functional activity during the healing process is more robust and is mechanically stronger than that gained through rigid immobilisation . The advantage of this type of bracing is that it avoids unnecessary immobilization of other joints and allows for earlier restoration of motion and function to the injured extremity . In 2000, Sarmiento et al. reported on 620 patients treated with a functional brace for both closed and open humeral shaft fractures, between 1978 and 1990 . They demonstrated that 98% of all closed injuries and 94% of all open fractures proceeded to union . Similarly, in their analysis of 195 fractures in 1995, Ostermann et al., reported a nonunion rate of 2% with treatment using functional humeral bracing . High rates of union have been demonstrated extensively over the years with acceptable alignment and healing occurring in more than 90% of cases [4-9]. Table 3. DASH, SPADI, CONSTANT scores, and elbow range of motion. Proponents of surgical management report rates of union and more anatomical reduction than functional bracing . Given the mobility of the shoulder and elbow, which is encouraged in functional bracing, angular deformities occur. However, these angular deformities are generally well tolerated with minimal functional impairment [1, 2, 11-13]. Matsunaga et al., compared surgical fixation and functional bracing and found patients who were fixed had higher DASH scores, higher rates of union, and less anteroposterior residual angulation . However, there were no differences with regards to the SF-36 score, pain level, and Constant score. Surgical complications included superficial infections, scarring and transient radial nerve neuropraxias. Operative treatment may provide more predictable alignment (which may not be functionally important) as well as immediate stability (which may lead to more rapid restoration of function), but it is associated with additional operative risks. The brace used by Matsunaga et al., was a thermoplastic type, and 2 patients in the bracing group did not tolerate the brace for reasons undisclosed, and 5 patients developed contact dermatitis. Our custom-moulded fibreglass brace had no such complications. Beyond these limits, deformity and functional impairment may be shown clinically. The design of our brace allowed unimpeded elbow and shoulder joint motion, with comparable elbow range of motion demonstrated in all our patients, and ‘excellent’ shoulder range of motion (CONSTANT scores) in all patients. We recognise that drawing conclusions from our DASH and SPADI scores is difficult, as questionnaires were administered at one point in time, with no ability, thus to detect any changes over time. Despite this, our study did demonstrate benefits in both pain and functional outcomes, which reflects directly on the efficacy of the custom functional brace. Excluding two patients who were lost to follow up, all patients proceeded to either clinical or radiological union, and analysis of radiographs revealed all but one fracture in acceptable alignment. Our results are similar to Swellengrebel et al., who compared a thermoplastic humeral brace with an above elbow fibreglass cast in 75 patients . They found no differences in union rate, and detected no major complications associated with the cast treatment. We believe our brace design is slightly superior in that it is not circumferential, can be adjusted using the velcro straps, allows easier inspection of the skin and soft tissue, and does not immobilise the elbow. 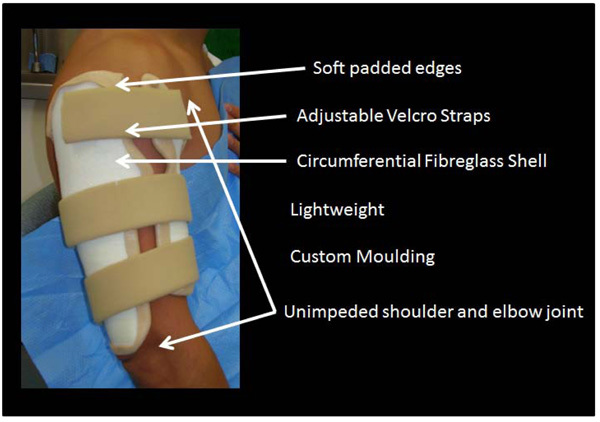 From economic perspective, the cost of our custom brace was AU$10.00. It took approximately thirty minutes to apply, and some patients had braces redone over the course of their treatment due to changes in swelling, and general wear and tear. The cheap cost of materials for our brace enable a reapplication of the brace as often as needed (maximum was three times for one patient in our study). The off-the-shelf Sarmiento brace retails for AU$47.70, which is approximately 4.5 times the cost of our brace. There have been numerous studies about the success of functional bracing in humeral shaft fractures. However, to our knowledge, most of the braces used in these studies are commercial plastic or thermoplastic designs, which we feel are limited with regards to their ‘moulding’ and customised support capacity. Limitations to functional bracing do exist and need to be taken into consideration when determining the appropriate treatment strategy for each patient. Patient compliance is the main limiting factor, as bracing can be a long treatment option, thus patients who are non-compliant with bracing are at a higher risk of failure. Non-compliance, in our experience, has been due to issues with comfort, high profile and heavy braces, and poor pain control due to poor moulding. By using synthetic semi-rigid casting material as our moulding material, and providing a lighter weight and soft padded brace, we feel that our brace achieves adequate fracture union with good clinical outcomes. With these promising results, we hope to recruit more patients in a future prospective randomised trial, comparing our brace with other products or treatment interventions, with intent to demonstrate that our custom functional brace is economic, better tolerated by patients, and effective in treating humeral shaft fractures. NSW health western sydney, Local health district approved this study. Written and informed consent was obtained from patients to use radiograph images in Fig. (4). Sarmiento A, Kinman PB, Galvin EG, Schmitt RH, Phillips JG. Functional bracing of fractures of the shaft of the humerus. J Bone Joint Surg Am 1977; 59(5): 596-601. Walker M, Palumbo B, Badman B, Brooks J, Van Gelderen J, Mighell M. Humeral shaft fractures: A review. J Shoulder Elbow Surg 2011; 20(5): 833-44. Sarmiento A, Zagorski JB, Zych GA, Latta LL, Capps CA. Functional bracing for the treatment of fractures of the humeral diaphysis. J Bone Joint Surg Am 2000; 82(4): 478-86. Koch PP, Gross DF, Gerber C. The results of functional (Sarmiento) bracing of humeral shaft fractures. J Shoulder Elbow Surg 2002; 11(2): 143-50. 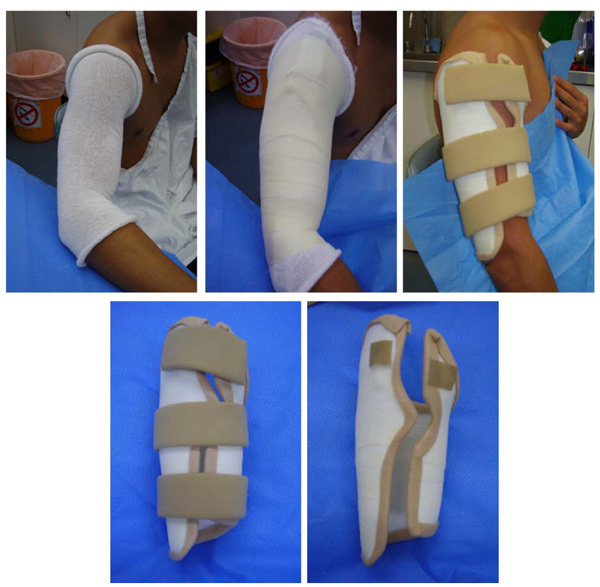 Rutgers M, Ring D. Treatment of diaphyseal fractures of the humerus using a functional brace. J Orthop Trauma 2006; 20(9): 597-601. Sharma VK, Jain AK, Gupta RK, Tyagi AK, Sethi PK. Non-operative treatment of fractures of the humeral shaft: A comparative study. J Indian Med Assoc 1991; 89(6): 157-60. Wallny T, Westermann K, Sagebiel C, Reimer M, Wagner UA. Functional treatment of humeral shaft fractures: Indications and results. J Orthop Trauma 1997; 11(4): 283-7. Zagorski JB, Latta LL, Zych GA, Finnieston AR. Diaphyseal fractures of the humerus. Treatment with prefabricated braces. J Bone Joint Surg Am 1988; 70(4): 607-10. Foulk DA, Szabo RM. 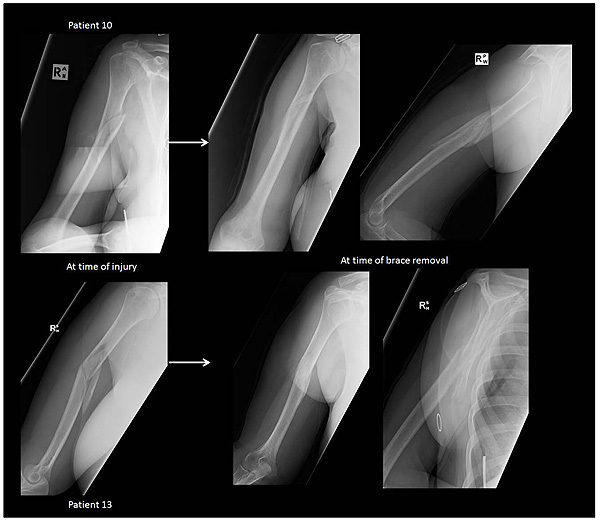 Diaphyseal humerus fractures: Natural history and occurrence of nonunion. Orthopedics 1995; 18(4): 333-5. McMaster WC, Tivnon MC, Waugh TR. Cast brace for the upper extremity. Clin Orthop Relat Res 1975; (109): 126-9. Tytherleigh-Strong G, Walls N, McQueen MM. The epidemiology of humeral shaft fractures. J Bone Joint Surg Br 1998; 80(2): 249-53. Matsunaga FT, Tamaoki MJ, Matsumoto MH, Netto NA, Faloppa F, Belloti JC. Minimally invasive osteosynthesis with a bridge plate versus a functional brace for humeral shaft fractures: A randomized controlled trial. J Bone Joint Surg Am 2017; 99(7): 583-92.